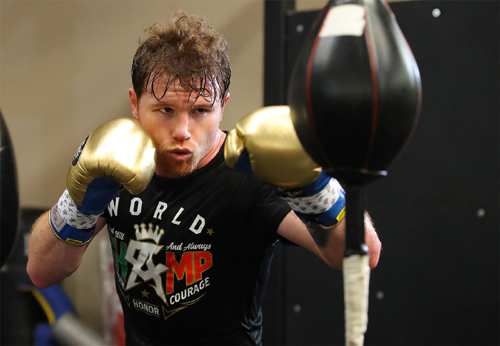 Lineal Middleweight World Champion Canelo Alvarez (49-1-2, 34 KOs) has stepped up training camp in his second home of San Diego, Calif. as he prepares to face WBC, WBA, and IBO Middleweight World Champion Gennady "GGG" Golovkin (38-0-1, 34 KOs) in the most anticipated bout of 2018. The event will take place Saturday, Sept. 15 at T-Mobile Arena in Las Vegas and will be produced and distributed live by HBO Pay-Per-View beginning at a special time of 8:00 p.m. ET/5:00 p.m. PT. 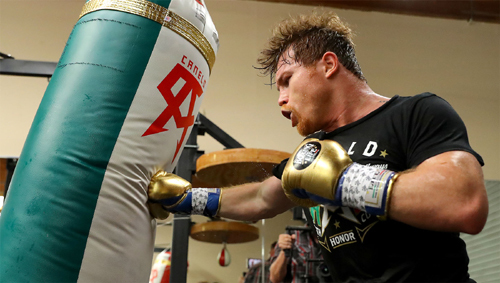 After a controversial split draw that left the boxing fans wanting even more - Canelo shared his revamped routine as he prepares for the historic rematch, which will take place on Mexican Independence Day Weekend. - Running every morning (except Sunday) at around 6:00 a.m.
- Training in the gym from 2:30 p.m. to 5:00 p.m. on Mondays, Wednesdays, and Fridays (jumping rope, shadowboxing, hitting the bags, working on strategy, etc.). - Sparring sessions at 2:30 p.m. on Tuesdays, Thursdays and Saturdays. - Diet consists of chicken, fish, and select vegetables. 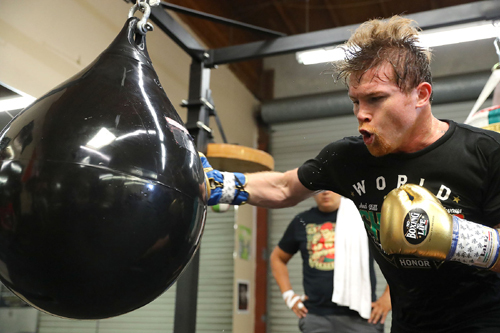 - This week Canelo will complete his fourth week of training and third week of sparring. 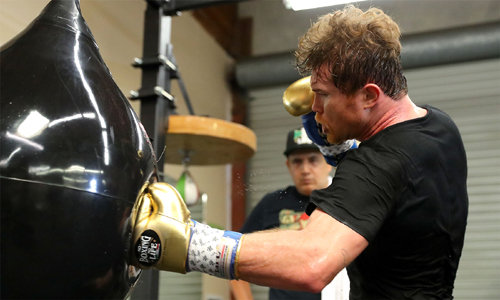 - Canelo's camp still has five weeks' worth of sparring left and he will complete 66 rounds of sparring this week. "The last fight gave us the blueprint for this rematch. We don't necessarily have to change the strategy; we just have to add to what we did. We have to throw more punches in every round. We need to do that to remove any doubts about the victory. For that we will work on our conditioning. That's what we needed a little more of in the first fight in order to be able to throw punches constantly in each round. "We have been training very well. We've been working hard on the conditioning. That's what we'll need a lot of in the second fight. We're focused. We're focused on the style of Golovkin. We know that he's not going to change. He's going to go out to do the same thing he always does and come forward. He may want to change, but when things get tough, he'll go back to the style he's been using his whole life and which he has never changed. "I've fought with very difficult fighters who are very difficult to land shots on and difficult to fight. I've fought with strong fighters as well. He's a strong fighter. He's a dangerous fighter. He is one of the toughest fighters I've faced. This is one of those fights we're I'll be the most prepared of my career. "I'm automatically a faster fighter than he [Golovkin]. My reflexes are quicker than his, so I could see punches [in the first fight]. But he has a lot of experience. He landed some shots on me, but that's due to his experience, and I could see punches as soon as he began to throw them. In the fifth round, I was hit with the kind of shot to knock someone out. It was between the ear and the neck, but I didn't feel anything. "I knew who Golovkin was from the beginning. He's been at 160 pounds for pretty much his entire career. I've always said that when I move up to middleweight, I would fight the best. He's supposed to be the best, and I felt very good in the first fight. His power is nothing out of this world. "I don't know why Golovkin's corner or team have been aggressive in their talks. It may be because of the rivalry we have. I don't know. I think they've gone too far. They've gone beyond just trying to sell the fight with their statements. I don't like talking or instigating with the fighter or even trying to make a show to sell the fight. People know that when we get into the ring, we're going to give a great fight, period. "In some sense, he might have offended me. But I always consider who's saying what. The truth is that Golovkin is my opponent, so I understand it. With Abel Sanchez, it doesn't worry me at all. Because at the end of the day, what about him? At the end of the day, he's not going to get in the ring with me. "It got more personal this time around. The little respect that we had for each other was lost. I'm using this as motivation. Everything that he has said has made it personal. What they said about who I am as a person has made it personal. But I will use it intelligently to my benefit this Sept. 15. "I dedicate this fight to everyone who has always supported me. To my family and my team, and to all the people who will watch the fight. It will be a great fight."